With the VGC TESL Program, we will get you ready for the adventure of a lifetime and a career you will love. We give you the qualifications to work and travel to other countries or stay and teach English in Vancouver and let the world come to you. This program provides pedagogical theory, teaching methodology, strategies and practical approaches to developing the skills and knowledge base you require to become an effective English language teacher. You will be given the opportunity to show application of methodology and skills in a real teaching and learning environment. plan a series of ESL lessons that cover different skills and systems for learners at different levels. provide and receive meaningful feedback to and from peers. reflect on your own learning and teaching, act on feedback, and demonstrate improvement. 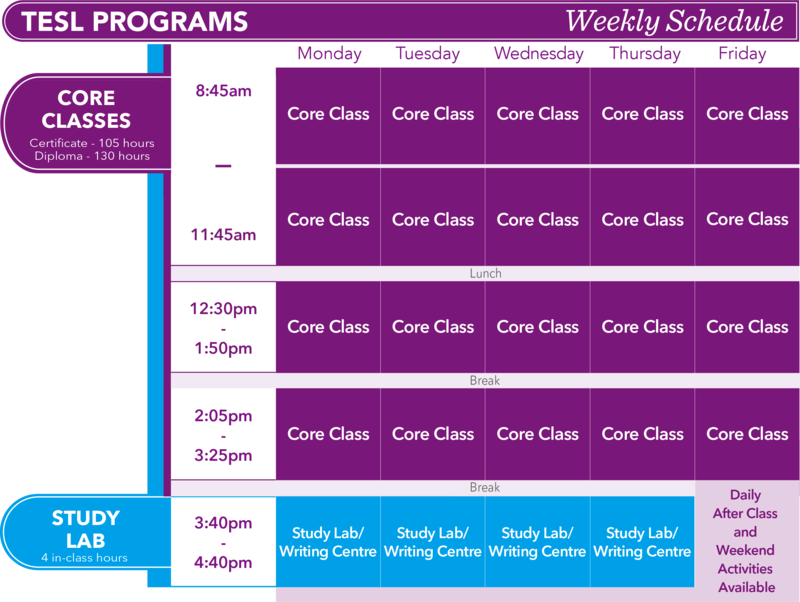 – Class start and end times may vary as schedules will be modified to accommodate Canadian holidays. Complete high school or be a mature student of 18 years and older. Reach an IELTS 5.5 (academic) or TOEFL 70 or equivalent or achieve a VGC Level 6 Upper Intermediate or pass the VGC placement test. Reach an IELTS 7 (academic) or TOEFL 100 or equivalent or achieve a VGC Level 8 Upper Advanced or pass the VGC placement test. Registration fee: $150 – Unless already registered as a VGC Student.